If you are aged between 18 and 35 with an outstanding idea/commercial venture for a start-up or existing business then you should enter the IBYE Competition. Almost any young person with a business idea can enter this competition. It doesn’t matter what your background is. Maybe you have been to University and researched a business idea, maybe you have always wanted to be your own boss, maybe you want to work for yourself, maybe you have an idea to improve your existing business or maybe you want to return home and set up your business in Ireland? 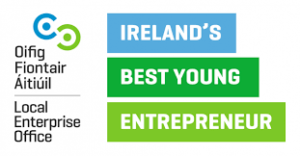 The IBYE competition is a national competition to find Ireland’s best young entrepreneur. Entering is simple and free. Apply online today at www.ibye.ie or www.localenterprise.ie. The closing date to enter is Friday, October 14th 2016.